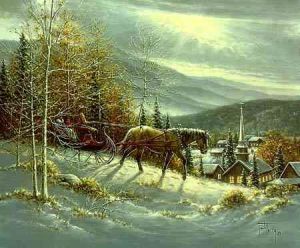 As the moon broke through the clouds atop the quaint village, the sound of sleighbells echoed across the snow-covered hills. On this frosty evening, the nearby lights of town were a welcome sight to this young family. They made their way to the church just below the hill to share in a celebration of the season. The time spent with loved ones was predous. It was a night when the simple things of life brought joy and peace, like "Sleighbells and Moonlight."